There are books of poetry that jump out and hit you on the head with overwrought emotion, opinions or anxieties. This Little World is not one of those. It’s a book that demands a quiet space, for you to take the time to slowly read – or re-read – individual poems so that they sink in, the way a good conversation with a friend sinks in, follows you throughout the day; the way snippets of chat are later recollected and gain added meanings, maybe even a different perspective. These are poems that need time, the way a friendship needs time. At the outset of her collection, in the poem ‘Rear View’, Karen J. McDonnell asserts: ‘I drown in other lives’. This Little World looks back through time and memory, through different perspectives, including those that flare beyond Ireland’s boundaries. From the hills of Clare to ‘Sleepless in Armagh’ to a soldier on the Somme to Limerick in 1918 to Nazi death camps through to present-day Middle East to Syria, McDonnell fashions poems out of the quiet unseen moments – the small incidents and insights – recognising that we are all human, together. In ‘The Good Room’ – an evocative title for any Irish person of a certain age, a room we’ve been banished from or invited through depending on the circumstances – the poet looks at transgression, at spending time in spaces we’re not supposed to: ‘Tell me, child, why / do you still grasp this time-shard / when memories are lost as easily as a daisy hair clip / in a day’s rough and tumble?’ The poem asks the question within a memory, providing delicious irony. And isn’t this the role of the writer, to watch and remember and piece it together later, to illuminate context and meaning? Another glimpse of Irish-ness is contained in the powerful poem ‘Shell Gathering’, which opens with an image that is very much located in Ireland: ‘Coming home from the funeral / we stop in the hot day / for ice-cream at Crusheen.’ This image sets the scene for shell gathering beyond these shores, creating a breathtaking twist. Well, you’ll have to read the collection to discover it. This Little World does what good poetry should: transform the everyday and draw our attention to it. The poet takes the sense of powerlessness felt when faced with natural or man made disasters beyond our control, and from them casts images of beauty. The poem ‘In Zaraq’ features the lines: ‘On a high wire / a plastic bag hangs / like a hawk / treading stilled air.’ It brings to mind an earlier poem, ‘Swansong’, so that both images reverberate across my mind: ‘A discarded fertiliser bag. / I tried to fool myself, but the sea / slunk out, leaving behind a / desolate, soaked swan / that I couldn’t reach.’ What else can we do when faced with the impossibility of action but write, or failing that, read a poem? One of my favourite poems of the book, ‘Palmyra, 2016’ contains the striking observation: ‘Even ghosts can only bear so much suffering.’ So the collection ends, halfway across the world from County Clare, where it began. But now comes the christening, the publication of Karen’s poems in the world, the celebration with friends and family as This Little World joins the extended family of books already published, as her new book – her first – joins the conversation between poems – and poets – across boundaries and through time, goes out to find its place in this world, independent of the poet who birthed it. Celeste Augé is the author of Skip Diving (Salmon Poetry, 2014), The Essential Guide to Flight (Salmon Poetry, 2009) and the collection of short stories Fireproof and Other Stories (Doire Press, 2012). 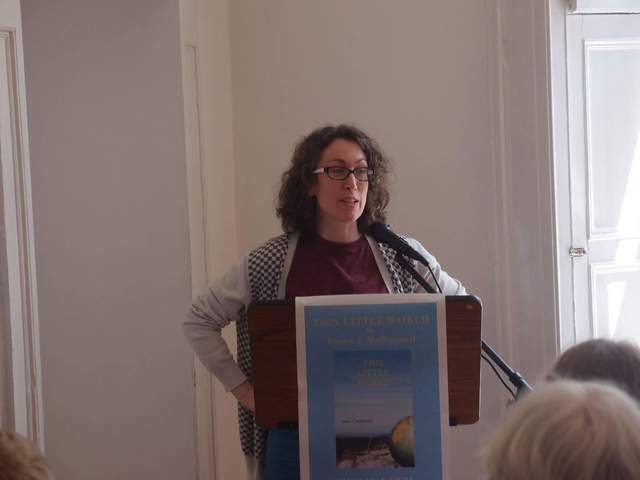 Her poetry has been shortlisted for a Hennessy Award and in 2011 she won the Cúirt New Writing Prize for fiction. She lives in Connemara, in the West of Ireland, with her husband and son.